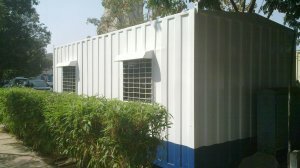 Sintex Cabins is India's Leading Portable cabin manufacturer. We specialize in manufacturing and supplying of all types of Portable Cabins which can be used as Site offices, Security Guard cabins, Portable Toilets & Bathrooms, Bunk house, Portable Buildings and Modular Buildings. Our Portable Cabins are best in quality with excellent aesthetics and with a life span of more than 25 years. Sintex Cabins Porta cabins are High at Quality but Low at Cost. Sintex Cabins Portable Toilets come with inbuilt plumbing accessories. The toilets can be customized to include EWCs, Urinals, wash basins etc. From enquiry to delivery, you will receive top quality service, and we guarantee that no matter how complex your specification we will deliver you the same build priority as a more conventional project.We hope that you will find this site informative, and we would welcome the opportunity to discuss any enquiry you may have.